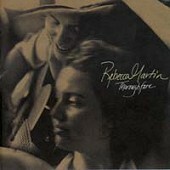 The first time I heard Rebecca Martin was a live performance by her previous band Once Blue at a taping of the radio show Mountain Stage. I was immediately taken by her gorgeous vocals and their beautiful jazz-inflected pop songs, and grabbed a copy of their debut disc. While it was unfortunate that the band broke up after that one release, Rebecca has finally released her enchantingly beautiful solo debut Thoroughfare. Thankfully Thoroughfare isn't that much of a departure from Once Blue, continuing down the familiar path of gentle, largely acoustic, pop songs with jazzy nuances that really set them apart from the pack. Rebecca's deeply emotional, lilting vocal-work and heartfelt lyrics are the icing on the cake of this superb release that was by far my favorite disc of 1999.